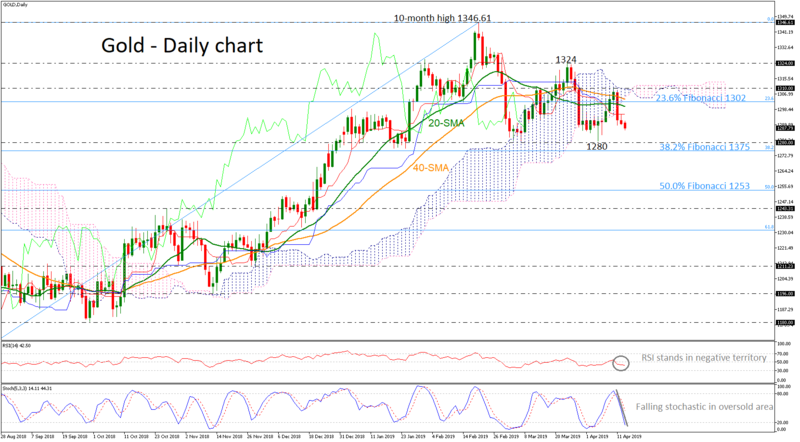 Gold remains under pressure and the risk is still to the downside as prices continue to drift lower from the 23.6% Fibonacci retracement level of the upleg from 1160 to 1346.61 around 1302 and beneath the 20- and 40-simple moving averages (SMAs) in the daily timeframe. The short-term technical indicators are bearish and point to more weakness in the market. The RSI indicator is moving slightly lower in negative territory, while the stochastic oscillator entered the oversold zone. The next target is the April 4 low at 1280 and marginally below that point lies the 38.2% Fibonacci of 1375. At this stage the market would likely see a resumption of the downtrend from the ten-month peak of 1346.61 and put in place a lower low at the 50.0% Fibonacci of 1253. Upside moves are likely to find resistance at the 23.6% Fibonacci of 1302. There is an important resistance zone between this level and the 1310 barrier as it encapsulates the Ichimoku cloud. Rising above this area would help shift the focus to the upside towards 1324. Breaking this level could see a re-test of the 1346.61 high and turn the bias to bullish. Concluding, the yellow metal seems to be bearish in the short-term picture as it failed to jump above 1324 and only a daily close above the ten-month peak could confirm the medium-term bullish structure again.